Climate change, variations of solar irradiance and physical state of the circumterrestrial space have significant impact on many kinds of human activity and the natural variability. The history of mankind knows severe examples of the vulnerability of human society of these dependences. The presence of a link between the Sun’s activity, galactic cosmic ray (GCR) flux, effectively modulated by Sun, and the Earth’s climate has been claimed in many works. Consequently, the possible solar contribution to the global warming of the last century is at present actively debated. However, our modern knowledge about the past of the phenomena is quite insufficient since direct instrumental records are rather short. Analysis of high-resolution solar and climatic long-term proxies makes it possible to fill the gaps in our knowledge. The eBook is written in frame of a multi-disciplinary approach and collects efforts of specialists in different scientific fields, including solar-terrestrial relations, paleoastrophysics, paleoclimatology, dendroclimatology. It describes well the most up-to-date methods of solar paleoastrophysics and paleoclimatology and accumulates a lot of information about solar and climatic variability over time scales from decades to millennia. It contains both detailed survey of experimental results, testifying reality of solar-climatic relationship, and discussion of possible physical mechanisms providing a link between the Sun’s activity and the lower atmosphere. The eBook includes some interesting results not well known outside Russia e.g. published only in Russian or obtained by scientists who work out of the Russian (Soviet) Academy system. The eBook emphasizes necessity of the complex approach to the problems of solar-terrestrial and solar-climatic relationship. It will be useful for researchers which work in solar-terrestrial physics, climatology, geophysics, astronomy, for post-graduate students and students of older years. Solar activity is a phenomenon very important for the mankind existence. Presence of link between Sun’s activity, galactic cosmic ray (GCR), effectively modulated by Sun, and Earth’s climate has been claimed in many works and possible solar contribution to the global warming of the last century is actively debated. Clarification of the nature and mechanism of global warming will supply us information about the climate behavior during at least few future decades and, hence, is of a great importance for all the humankind. However, a lot of questions still retain and many problems have to be solved. If solar and GCR contribution to global warming really exists, what is its extent? What are the physical mechanisms, providing link between solar activity, space weather and climate? What is greenhouse contribution in global warming? What is the role of volcanic activity in long-term climatic change? Do change in geomagnetic dipole field affect terrestrial climate? The answer to these questions needs detailed information about the past of solar activity, space weather, solar-terrestrial interactions, climate and geomagnetic field over as long time scale as it is possible. However, the modern knowledge about past of these phenomena is quite poor and has substantial gaps. Really the direct temperature records usually cover no more than last 100-150 years. Series of measurements of different parameters of solar activity also are short. The longest of them – group sunspot numbers – started since A.D. 1610. Accurate observations of solar flares, research of GCR by means of neutron monitors and direct satellite measurements of different space weather parameters cover less than 55 last years. That is why our knowledge about long-term (decadal, centennial and millennial) variability of the solar and terrestrial phenomena is very limited and many features of mechanism, linking solar activity, space weather, volcanic aerosol loading and state of the Earth’s atmosphere, are still need to be clarified. This information, in turn, can be obtained only with using proxies, such as: (a) historical data (catalogues of ancient auroral and sunspot observations)? (b) data on concentration of cosmogenic isotopes and ions (14C, 10Be, NO3- , SO4-) in natural archives. These proxies are yielded by paleoastrophysics and can span more than 10 000 past years. Modern paleoclimatology provides irreplaceable tools in constructing increasingly confident histories or chronologies of past climatic changes using natural archives. High-resolution paleodata are particularly perspective. Dendroclimatological reconstructions, which use tree-rings as climate proxies, have the advantage of annual resolution. Stable isotope data (18O, D) make it possible to investigate climate variability over much longer time scales often with annual resolution too. Borehole temperature measurement, paleobotanic data, historical documentary records and melt layer thickness are other proxies used by paleoclimatology. Methods of paleoastrophysics and paleoclimatology have been intensively developed during the last 20 years. Therefore, a lot of new information has been accumulated, including many reconstructions of sunspot numbers, solar flares, global and regional temperature covering time intervals from present to 10 000 years backwards along the timeline. Recent advances in paleoclimatology and solar paleoastrophysics have made it possible to study the evolution of climate and different manifestations of the Sun’s activity over long (from multi-decadal to multi-centennial) time scales, which have previously been inaccessible. We describe a huge massive of the new results, obtained in these fields by many workers, including the authors of the book and provide a systematization of these data, some of which are rather controversial. Modern progress in paleosciences makes it also possible to test possible solar-climate connection over the long time scale that is of a great importance. Actually, all the physical mechanisms of a link between solar activity and lower atmosphere were carried out using rather short (less than 10-20 years) experimental data sets. 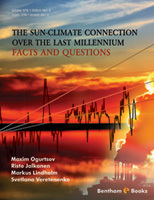 Examination of suitability of the known solar-climate mechanisms for explanation of the much longer phenomena, performed in the book, brings new evidences of the reality of solar-climate link. We provide also a summary of present understanding in solar activity evolution, solar-terrestrial interactions and the possible mechanisms determining the reaction of the Earth’s climate system to solar-cosmic factors. Possible scenarios of the future climate evolution are considered. A discussion of the accuracy and reliability of the available solar and climate proxies is included. We believe that the book will not only help the readers in developing a better understanding of the solar and climatic variability and solar-terrestrial interactions but will emphasize the necessity of further systematic and intensive study in all these areas. M.G. Ogurtsov expresses his thanks to the exchange program between the Russian and Finnish Academies (project No. 16), to the program of the Presidium of RAS No 22, and to RFBR grants 13-02-00277, 13-02-00783 for financial support. The authors are also thankful to the anonymous referees whose recommendation allowed improve the eBook substantially.